Interactive maps can be applied across the different levels of government, from Local to State, Regional to National. Projects with multiple layers and broad reaching scope can be conducted that provides housing, population, voting, and school data across counties, school districts, legislative and Congressional districts. Or, smaller single-interest projects for local governments can also be accomplished based on the particular interests of the community such as investigating historic districts or farmland in a particular location. 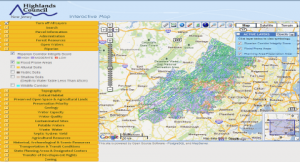 New Jersey Highlands Water Protection and Planning Council has created this interactive map as a planning tool and a way to provide the public access to various types of information. These include zoning, preserved land, state planning areas, agricultural resources and many other data sources. Allows the user to take data provided and select different features present on site geographic layers to create and download a consistency report. Allows the user to take data provided and select different features present to create and download a credit estimator report. Displays easement inspections and violations of land parcels in Bedminster Township, New Jersey, a town that was created in 1749. Provides a map of lead-safe rental housing opportunities in Morris County, New Jersey, especially those built prior to the lead paint ban in 1977. Provides data for counties, municipalities, school districts, state legislative districts, and federal Congressional districts in NJ. Population, housing, school, and voting data can be downloaded and saved electronically, as well as fiscal and economic profiles and maps. Shows Points of Interest throughout the Sourlands such as natural features, historic landmarks, parks, land preservation, and general comments, notes, and occurrences in the region. The site is used to represent local environmental knowledge, community values and land use preferences. Highlights Agricultural Tourism in NJ and provides a way for visitors to locate affordable, family-oriented recreational and educational adventures and activities.